Travel back in time to meet medieval monarchs, wander through winding, eerie 13th century underground defences and explore the Secret Wartime Tunnels deep within Dover’s White Cliffs. 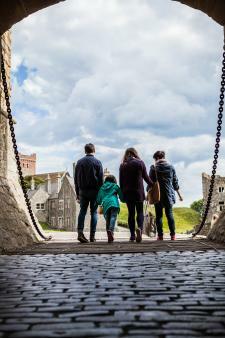 A trip to Dover Castle offers an action-packed day out for the whole family and our parents-and-children testers loved every minute. There's no shortage of things to do at Dover Castle, whether you're interested in medieval history or WWII strategy. Michelle Bown visited with her partner Lee and their children Maddison, 8, and Dillon, 5. 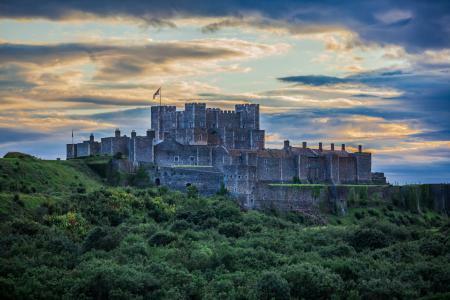 Dover Castle is a great day out for families of all ages, well worth the entrance price and an ideal location to embrace history, breathe in the sea air, soak up the scenery and have as much fun as you can without embarrassing your children! We feel there's still many an adventure to be had (there's a lot on offer over 80 acres, too much to pack into one day!) and will be returning again soon. Next time we aim to go on an event day as they offer medieval falconry demonstrations, knights' duels and re-enactments to name a few. The Castle itself is extremely inviting for children, including younger guests. They were able to touch, open, sit and play with most of the items on show and each room oozed history, sparking many questions from our 8-year-old (thankfully the information plaques around the castle provided the answers she craved!). With the castle corridors providing hidey holes and the medieval tunnels revealing secret passageways our 5-year-old was in his element, exploring each corner and crevice and discovering where the next tunnel led. The opportunity to play hide and seek was not lost on Daddy and we all got many a fright when veering round corners! The furnishings in the Great Tower offer a recreation of the king’s chamber in a late 12th-century royal palace and the vibrant colours and plush materials are very attractive to children (though you may have to remind them a few times not to curl up on the king's bed for a rest!). You can perch on the royal throne and pose for a picture, give pots a stir in the royal kitchen and look out for ghostly projections of the medieval inhabitants. The royal court comes to life on selected dates during the year; try to time your visit to 'meet' one of England's greatest kings, Henry II, who built the largest European empire of his age, and his celebrated wife Eleanor of Aquitaine. Operation Dynamo, the May 1940 evaculation of Dunkirk in WWII, was masterminded deep within Dover's secret wartime tunnels. Special effects, projections and real film footage bring this dramatic rescue operation to life and KS2 children will find the tour immersive, enthralling and insightful (as will the adults!). Make sure you arrive at Dover Castle early to ensure you get a space on the very popular tour, and bear in mind it may be a little too in depth for 5 year olds! The wait to go in can be extremely long (we queued for 1hr 40 mins for the 20 min tour) so plan your day around it. There is also an Underground Hospital tour which allows you to experience sights, sounds and smells as you follow the journey of a wounded WWII pilot, fighting for his life as he is rushed through to the operating theatre, but again the queue can be very long, so plan ahead! 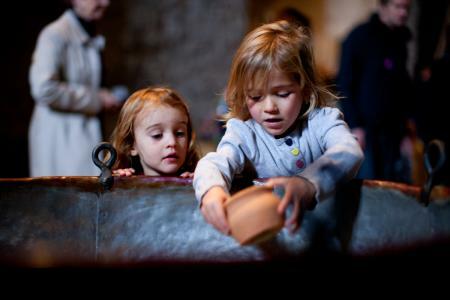 The introductory exhibition before you enter the Great Tower, which really brings the medieval period to life with interactive fun and games for all the family. 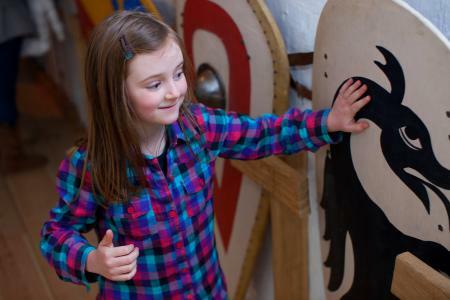 There are lots of themed weekends and holiday workshops at the Castle, so do check what's on offer (like knights training or a WWII assault course) before you travel. The creepy Halloween events are of particular interest to kids! 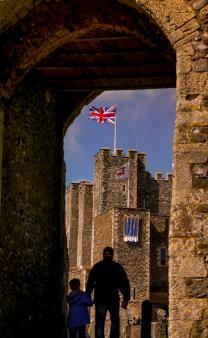 The grounds of Dover Castle are vast and the courtyard has much to offer with cafes, exhibition rooms and gift shops. We took our own picnic and found no shortage of picnic tables to sit at although Maddison was on seagull watch the whole time! We stopped off for a lovely cream tea in one of the cafes and their prices for food and beverages were reasonable for most items (children’s lunchbox meals were £4.50). Gluten-free sandwiches and certain allergy requirements were also catered for on request. Dover Castle is east of Dover town centre, close to Dover Priory train station. Opening times depend on the time of year, so check online before you travel. Core opening hours are 10am to 4pm (open later in summer). A Family ticket (2 adults plus up to 3 children) starts at £46.80. The gift shops offered a wide range of products from medieval dressing up to jams and jute bags. The children had no trouble finding lots of things they wanted to buy and there were plenty of pocket money items ranging from £2 to £5 including toy knights and horses in keeping with the theme of the day. Read about Dover Castle's long and varied history.